September 2013 – Change is possible! I don’t know, am I supposed to do this? Share this blog without permission? I thought the post was a good one, and WordPress encouraged me to share it. The blog author did too. I shared from her site, so it must be okay, right? My first time doing this, but I thought this list of tips was worth the risk. I hope this is proper blogging etiquette. Check it out: How to maintain a gluten-free diet. It’s hard to believe that we are almost at the end of another month. Wow, where did September go? October 2013 looms large on the horizon, and with it, another challenge for this gal. In just four days I will embark upon October Unprocessed, a global initiative that I believe will strengthen my resolve to heal myself with food; give me a better understanding of what it means to make my own food and not get it from a box, bag, carton, juice pack, or fast food window server; and help me to focus on one thing during October that has the potential to change my life forever. I’m excited about the possibilities October Unprocessed will provide, and would love to have a few others join me on this 31 day program designed to move America and the world away from processed foods and potentially poisonous chemical additives that seem to have leached into our food supply. I will be blogging about my experience with unprocessed food prep and eating during October, and you know me–what I write will be the truth, the whole truth, and nothing but the truth as far as I know it, from my personal experience. If I slip up, you’ll know it. If I am successful, you’ll know it. I won’t probably will bore you with details. I’m excited to share what I learn along the way from October 1 to Thanksgiving Day–the King of all food celebrations! October Unprocessed is important to me, so please pray for me while I try this. I’m already eating this way 75% of the time, but I want to go “whole hog” with this challenge. I will need support, so if you see me post something about a particularly hard day or meal, add your comments to the post. I read them all, and respond to them all. I soooo want to eat a huge, greasy, pepperoni and ham and egg and bacon and peppers and mushroom and extra, extra cheese pizza for twelve about now. The statement printed above is word for word what I typed in an email to someone today when faced with the frustrations that go along with dealing with imperfect humans. I honestly wanted to shove my face full of food. I felt that way for a good five minutes. What’s that about? I did not partake of any substance, save water, ice cold water, during this time, but I wanted to. Maybe these new healthy habits are beginning to kick in and become a working part of my processing brain? For today: I did not eat a huge, greasy, pepperoni and ham and egg and bacon and peppers and mushroom and extra, extra cheese pizza for twelve that I wanted to eat. That’s progress! What frustrates you enough to at least fantasize about going back to good, ole food for comfort? If you’re brave enough, do tell. Disclaimer: No twelve-slice pizzas were harmed during the writing of this blog post, nor after this web page was closed. NUMBERS. Today, I’m thinking about numbers, and all the things I could do to change the number on my bathroom scale. I could put duct tape over the digital readout and use a Sharpie marker to write in my own numbers. Duct tape is good for everything, isn’t it? I could hit the thing with a hammer and break it at the number of my choice. I could put away my digital scales and make a mock-up of a digital scale out of cardboard, and glue on digits I get at the hardware store to it to fill in the number I want to see when I look to that spot on the floor where my real scale now sits. I could just quit using the scale, and replace it with a crystal ball, or tarot cards, or an other method for determining my weight, other than trusting this piece of machinery. Probably not gonna do that one, or even think about it any more. …eat right, exercise, pay attention to how much fat and carbs I’m putting in my mouth, calculate how tight my pants feel today, and GET ON THAT SCALE to prove to myself that I am doing everything I can do to deal with my piece of America’s obesity problem. Hmmmm, I think I’ll pick that last option. Here’s the thing: for me, it’s about the scale, but not all about the number on the scale, or even moving that number down quickly. It is about eating right, healing my body through food, reducing the amount of fat I’m storing and carrying around every day, and seeing my blood sugar levels diminish and my diabetes go away. For some people, looking at that number on the scale every day becomes a trigger for bad behavior. If the number goes down, they celebrate with food. Conversely, if the number goes up, they feel defeated and abandon their food plan and all exercise, before caving to the urge to coast through life, fat be damned. I know. I was that girl. That kinda plan might work if you don’t have a life-threatening disease, but when you do, its time to be real. Scale or no scale, number or no number, my body knows when I eat right and when I eat wrong, or eat everything in sight, most of all sugar. It knows. I can’t fool my body. Nor can I fool my blood stream. If I put sugar in my mouth, sugar seeps into my blood, and my blood sugar levels rise. Scale totally unrelated. It is what it is. That’s why I’m spending so much time these days following truth and being honest with myself about what I’m eating. 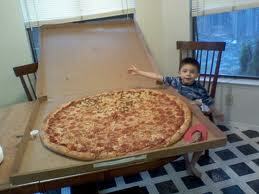 …days when I’d like to eat whatever I want, whenever I want, in as large a quantity as I want. But what I want and what is good for me are two different things. Besides, life is not all about food, and health is not all about a number. We are all different. We all have different needs. We all deal with different challenges. Some of us are triggered in our eating behaviors by the number that shows up on a cold, dead piece of steel that rests on the bathroom floor. Is that crazy? Maybe it is, but it is reality for many of us who have fallen into compulsive overeating patterns. As you can see, there are options. The better question, I think, is how can we care less about a number, and more about getting healthy and reducing the amount of fat we carry around and the medications we are forced to put into our body to help regulate things like blood sugar levels. I don’t want to dose myself everyday, so I’ve chosen to do battle with the crazy scales instead. I weigh myself every day, and when I’m done doing that I accept the number I’ve seen and I recommit myself to eating whole foods and less processed meals throughout that day. One day at a time. 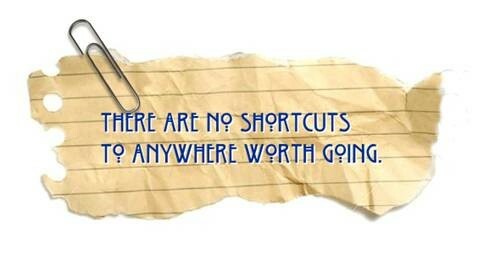 This has brought me measurable success, for which I am most grateful! Today, face those scales, but don’t be defeated by them. Take yourself to task and make YOURSELF master of your health. 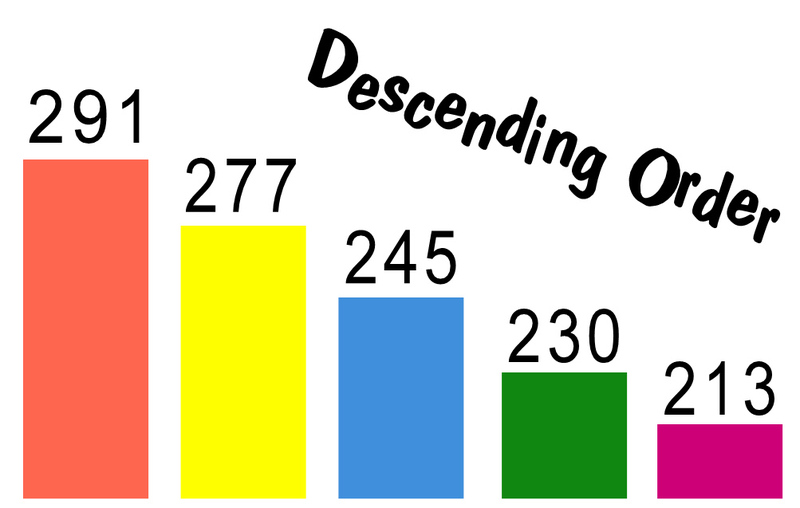 It’s not that farfetched to think you can beat those scales. I believe it can happen for you…for me…as we concentrate on getting better, one day at a time! 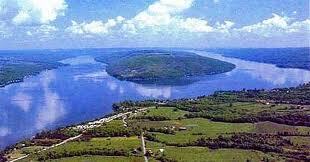 Keuka Lake at Hammondsport, NY is beautiful this time of year. In a few weeks, it will be even more spectacular looking. Fall is about to burst out in the NYS region, and when it does, watch out. The hills will be blazing with autumn colors: red, yellow, orange, brown and a bit of green splashed here and there. 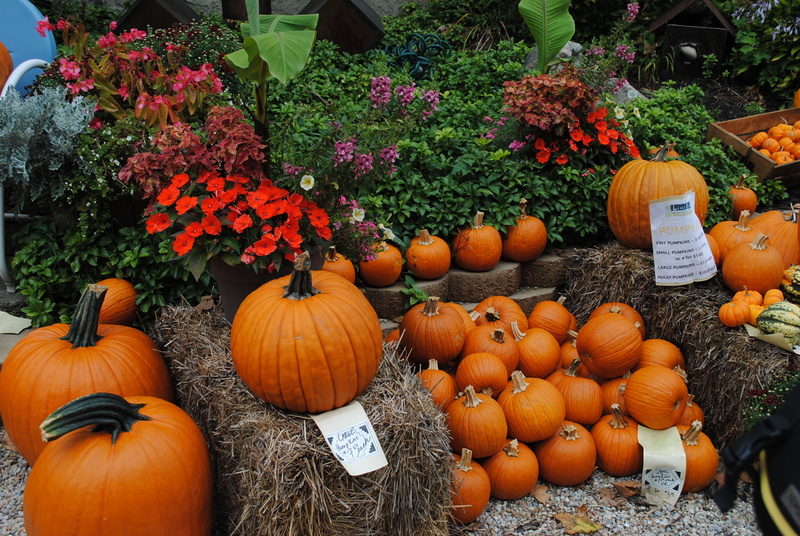 The Hammondsport area puts on quite a show in the fall, so if you can get there, get there over the next few weeks. 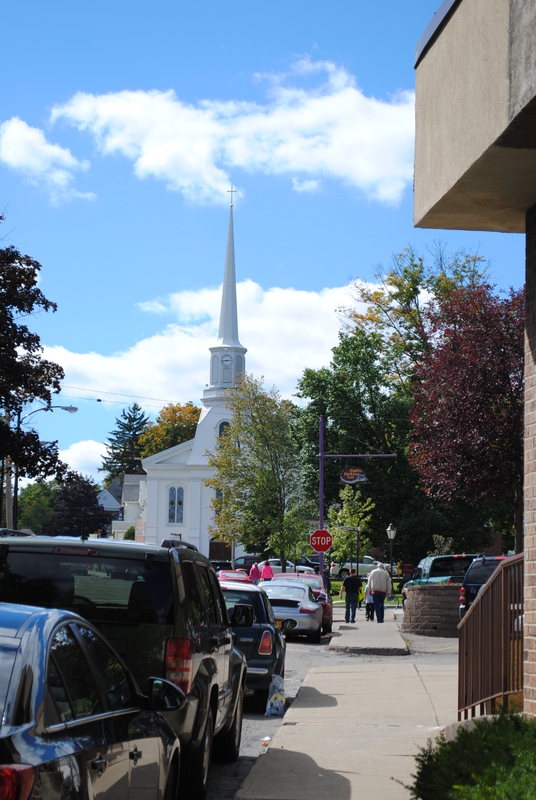 This morning I wanted to share a few pics of the town of Hammondsport that I took while I was there last Saturday. I think you will agree, these pictures are a tease for your travel plans. Add to the fact that the Hammondsport area has some excellent wineries and lots of water sports activities, and you can understand why this town was named “Coolest Small Town in America” in 2012. The lake area is only enhanced by the fact that the town itself is nestled down in a valley surrounded by rolling hills. What a recipe for serenity! Near the lake you will find plenty of opportunities to enjoy the outdoors and get some exercise. Small business is alive and thriving in this community, so there are loads of opportunities to walk, bike ride, water ski, sail, or kayak. There are also tons of small diners and antique shops lining the streets and surrounding the town square. And did I mention the wines. I don’t imbibe, but I know others do and they say the selections offered are tasty, indeed. Check out the things to do in Hammondsport, here (besides kayaking, which I recommend). 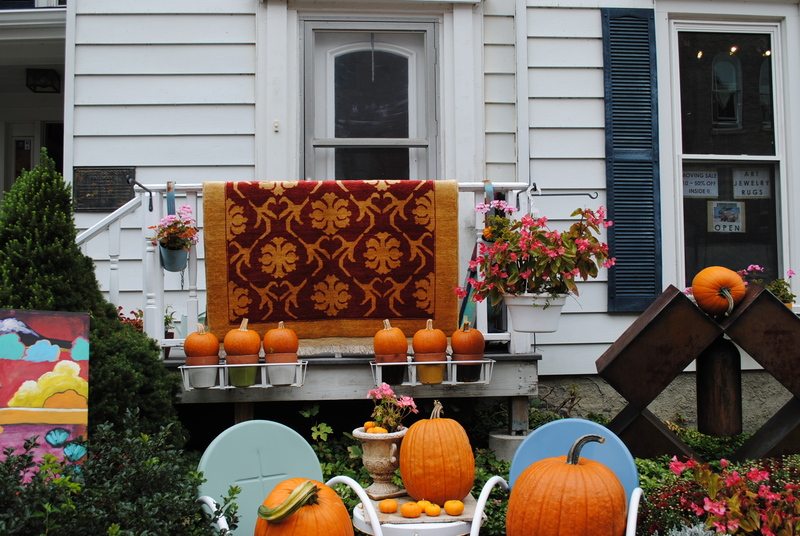 Because its fall, there were pumpkins and deeply colored flowers everywhere. 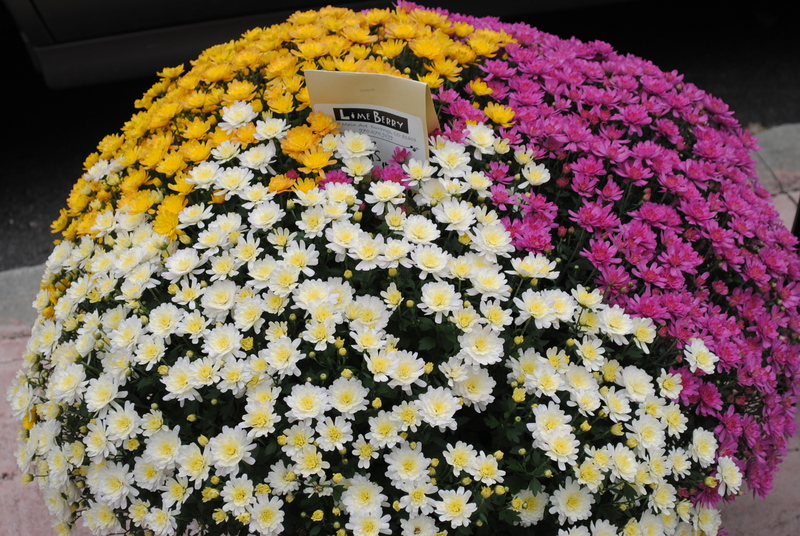 This mum was tri-colored and huge. I’d never seen anything so impressive on the streets of small town USA. We thought about bike riding, if kayaking wasn’t on the agenda for the day. I think it would have been fun to give it a try. Maybe next time. I’m just not sure about the hills around town. Them hills might make for a good work out. By the way, for those who care, I’m told I burned between 850-1000 calories during my two-hour workout on the lake. Not bad, for an activity that was thoroughly enjoyable! I snapped this shot of the church as we were heading up from the lake front. 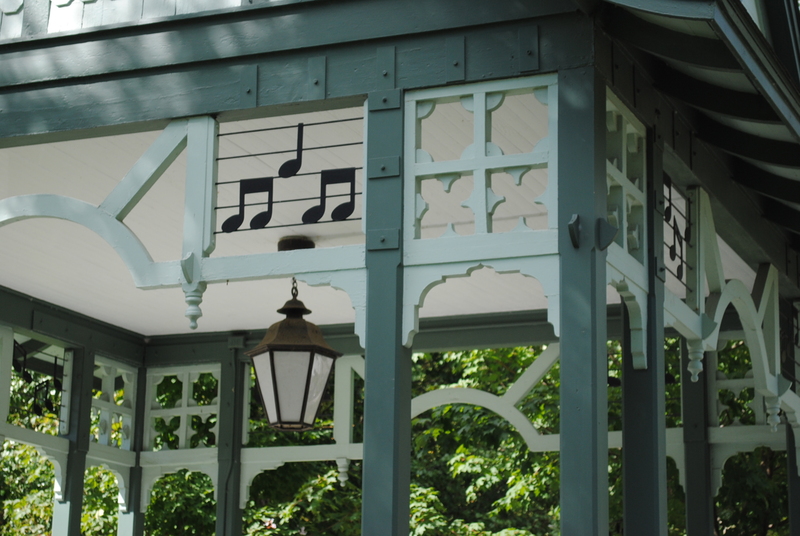 It sits behind the town square and is perfectly placed to be seen at any angle as you approach the center of town. I believe faith is a powerful thing, so I naturally wanted to get a picture of her majestic steeple. And look at that sky–gorgeous! 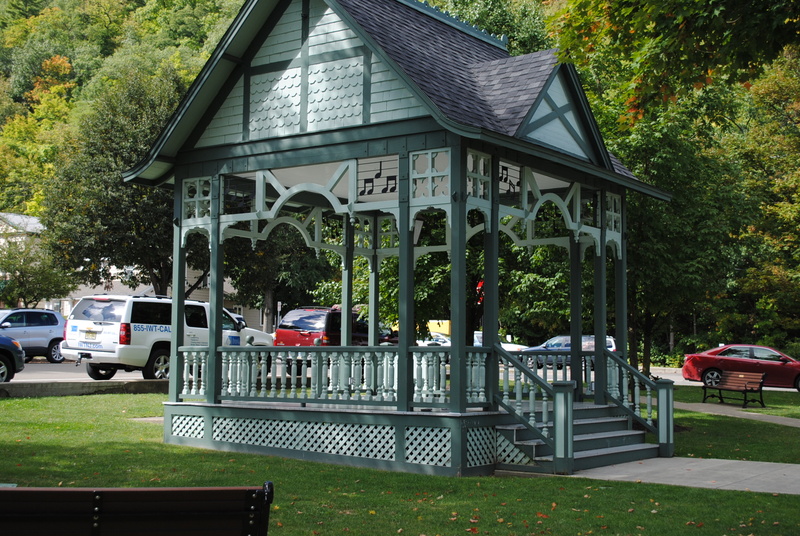 This gazebo sits in the center of the town square. It had some interesting detailing near the rafters, and seemed like the perfect place to enjoy an afternoon concert of the impromptu type. 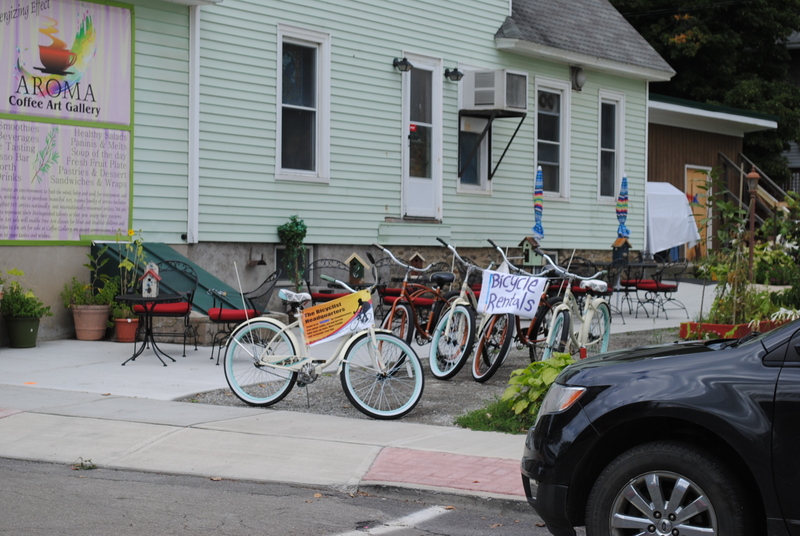 I should have shot lots more pictures while in Hammondsport, but seriously, there was just too much to do. Maybe next time I can grab a few more shots to share. It really is a beautiful place, as you can tell. And of course, a last shot of the lake. Isn’t that gorgeous. Photo not mine, but a great picture, nonetheless. 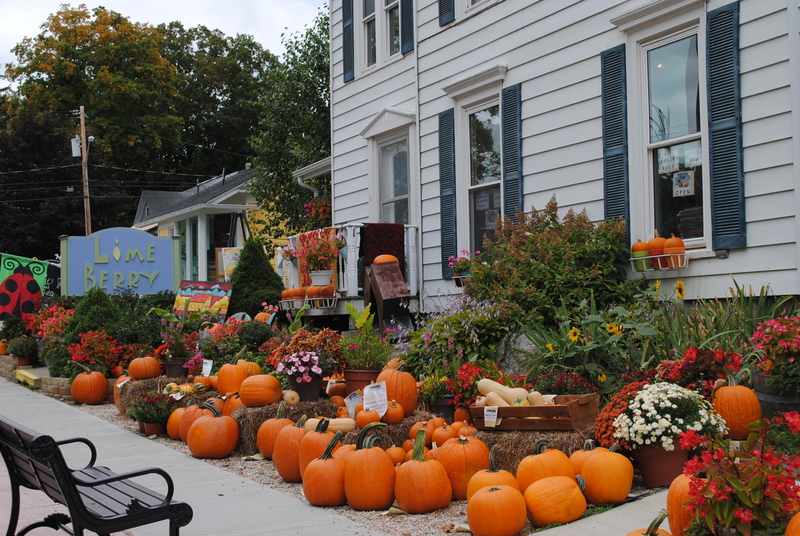 If you have a chance to visit Hammondsport, NY this fall, take it. You won’t be disappointed. The area has a lot to offer, and the people were so friendly. We really enjoyed our time there, and will definitely go again. I don’t know about you, but I’m always on the look out for a work out that will work for me without a lot of expense. I found this video at Yum Yucky’s website. It looks easy enough, and I think I can do this without too much trouble, though I may have to start with less weight. I don’t know how this might affect my feet, either. I’m having surgery in October again, so I might not be able to do this pulling and walking after that, but I think I could do it now. Let’s see, what do I have around the house that weighs 20 or 25 lbs and is seemingly indestructible? Tractor wheels, old metal parts…these are the cast aways that rust into ruins on the farm. Why not give them second life? I’m definitely going to give this a try! Wheat Belly scared me, I will not lie. We all love our bagels, pizza, and pies, cookies, and cakes, right? The thought of never touching them again, yikes, it got my attention and held it for days. I was mesmerized by the idea. The initial supposition of Wheat Belly, however, seemed flawed to me as soon as I began reading. At the beginning of the book, Dr. Davis says all that is needed to lose weight and get healthy is for the eaters of wheat to give up grain. Yet, toward the end of the book, he provides an eating plan that includes much more restrictive behavior modifications than simply dropping the wheat. I wondered, what gives? I dropped the wheat in August of 2013 and I lost a few pounds; pounds I probably would have dropped any way, since I am on a personal crusade to get to my goal weight, if it kills me. The good news: I did see some positive benefits from quitting the wheat for 30 days about 23 days. I saw a reduction in my itchy scalp problem, which was great, and I did see a reduction of the bloating that I often experience after eating wheat-based products. My belly actually did look flatter after just a few days of abstinence. I also believe that my cravings for sugar diminished when I did not eat wheat. Although I also quit a lot of the sugars and artificial sweeteners I had been using during this same time period, so how much of this was due to dropping flour, and how much to dropping sugar is yet to be known. I think they are first cousins anyway (wheat and sugar), considering the problems they both cause, especially when trying to reduce body size. I believe eating processed white flour in its many forms is responsible for the sickness this nation struggles under to a great degree; I will say that. By the time I began reading this book, I had already changed my eating patterns and food choices quite a bit, so had that not been true, I might have seen more drastic results from quitting the wheat. It was hard staying away from all processed flours and doing so affected my GI tract quite a bit. I’m still not eating a lot of grains, and I’m still having some problems with constipation or a slowed GI tract. It is for this reason, mainly, that I am considering going back to eating a whole grain bagel, toast, or cereal in the morning in the near future. I just have to figure out if I want the itchy scalp back, as a trade-off for the improved GI processing. Tough choice. Next Review: The End of Diabetes, by Dr. Joel Furhman. See a sneak peek of what I had to say about this book, now that I’m half way through it, here.